This is a very healthy recipe without losing out on taste. 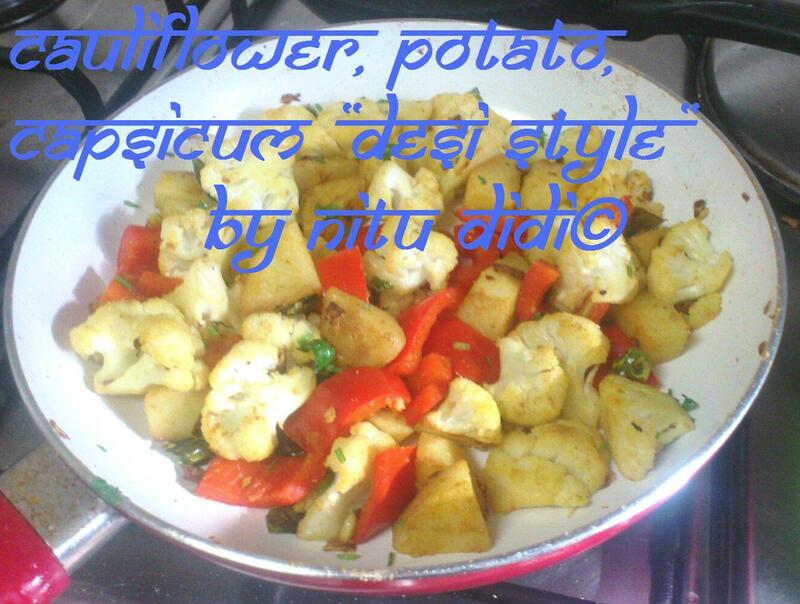 A simple “aloo gobi” or desi cauliflower and potato recipe lightly flavoured with spices and made in olive oil. This recipe uses a bit of vegetable broth to cook the vegetables slightly making it extra rich in vitamins. Olive oil is used for this preparation giving it a real different taste. I do not add many spices as it is not the regular run of the mill recipe. You can always add more spices or red chilli flakes for more heat. The vegetables remain crunchy thus retaining all their nutrients. This makes an excellent main or side dish and can be served with roti, naan or even a simple pullao.For Jain recipe please omit the ginger. Serve as a main dish or part of a low calorie diet or even as a spiced warm salad. This dish is delicious , nutritious and low calorie. Which stock cube did i use? This entry was posted in Everything Vegetarian, Fusion, Gluten Free, Healthy Options, Jain recipes, Low Cost, Quick Recipes, Vegan and tagged cauliflower, ceramic pan, eggless, jain, low calorie, olive oil healthy, Vegan, vegetables, vegetarian. Bookmark the permalink.